This post is less about our books here at the Quill, and more about life as a Porcupette. As you may know from reading the blog, I haven’t been a Porcupette quite as long as Caleigh had – I just started in April of this year. Caleigh was the first Porcupette to work remotely – fulfilling her duties from Kingston for awhile, and then she spent some time at the shop in Erin, and then she jetted off to France and worked from there, too. I’m also an “out-of-office” Porcupette, though my digs here in Toronto aren’t quite as exotic and exciting as Caleigh’s were in France. Alas! Whether you’re a jet-setter or not, there are a lot of pros and cons to being a remote intern. Let’s talk about them! 1) There’s almost nowhere(1) to live in Erin. Being able to work remotely means you can live anywhere! 2) Flexible hours – You can work around class schedules, other jobs, or become nocturnal and only work in the midnight hours, if that’s your thing. 5) If you live in a rural area and there aren’t many employers in your field near you, a remote internship would be a great way to learn about a career you might like, without having to relocate right away. There are a ton of other reasons why remote interning might be ideal for you – it’s a very subjective experience. 1) Having never visited the shop in Erin (yet! ), there are a lot of questions I get asked about it that I can’t answer. 2) You almost ever see your co-workers. For some people this makes communication difficult, and depending on the job, some tasks might be difficult to coordinate over email. 3) I’m a little sad that I’m not near Holtom’s Bakery. 4) Like taking a correspondence course in school, many of your tasks are completely self-directed. 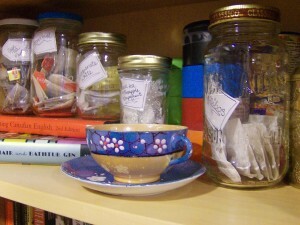 If you lack self-motivation or struggle to stay organized, it will be really, really difficult to keep on top of things. And on that note, let’s talk about organization – organization is crucial to most jobs, but it becomes exceptionally important if you’re a remote intern, or when you’re juggling school and work at the same time. Sticky notes, bookmarks, flags, tape, envelopes, Fall 2011 catalogs, press clippings, and books I’m currently working on reading guides for. 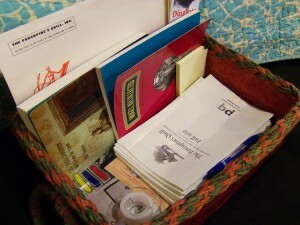 The basket also holds small pocket-sized notebooks and pens, for taking notes while reading, or for jotting down any ideas I have while out and about. I try to put any of my PQL-related material (or, at least, anything that can’t be hole-punched and put in a binder) in here so that nothing gets lost. It stays on a shelf by the front door, so I can grab the pocket-notebooks, pens, stickies, and books right before I head out for the day. This giant 4-inch binder (the PQL bible, as I affectionately call it) holds all of my notes and PQL information, including grant application checklists, login information, manuscripts, tipsheets, marketing reports, and press printouts. Everything is (of course) organized with tabs inside, so nothing gets misplaced. A three-column to-do list helps keep tabs on everything that’s “on-the-go” and allows space for notes on how things are progressing. Assigning everything a due date (even if Tim hasn’t given one) helps me allocate my time as effectively as possible. We also keep digital timesheets (tracking what I’ve been working on, in 15-minute increments), and I keep spreadsheets full of contact info for different authors, editors, librarians, book bloggers, and other sorts of things I use when working on marketing and sales campaigns. So, all you current/potential interns out there – how do you stay organized? I’d love your tips and tricks! (1) Certainly nowhere that is cost-effective for interns. (2) You can also: air-guitar like a boss, talk/read aloud to yourself, wait for your water-heater technician to show up without missing work, play loud music, and so forth. (3) Do try to leave the house on a regular basis. (4) My favourite part about New Year’s is getting to buy a new agenda. I know. I’m really cool, guys. (5) And you can test out your hoops skills by lobbing crumpled-up, completed stickies into the bin. This entry was posted in Letters from the Porcupette (the Intern's Blog) and tagged future interns, internship, life at the quill, organization. Bookmark the permalink.